The openness of Brightworks school reflects the founder’s vision for education: honor thy creative impulses. On a typical day at Brightworks, a private school in San Francisco’s Mission District, students are welding, listening to indie music, and writing novels. The school opened its doors last September with a simple goal: trust your kids more. Rose-price starts her class period with a dramatic opening: “Ladies and gentlemen of Brightworks, I’d like to welcome you to this show of ‘Margie Thinks He’s a Murderer.’” It’s an introduction to the sock puppet play the students will perform today about confused, albeit murderous, animals. It’s a little different from what students in a more traditional school might be doing, but to the Brighworks co-founders, that’s the point. Brightworks collaborators say they don’t ignore the three “R’s” – Reading, ‘Riting, and ‘Rithmetic – but they say they take their own approach to them. The school uses a curriculum that Tulley created called “the arc planning process.” The curriculum involves three phases: Exploration, Expression, and Exposition. The first includes bringing in experts of differing perspectives on a single topic; the second asks students to express all of the ideas learned from the first phase in a new way. And the last phase, “Exposition,” is basically show-and-tell. Tulley’s approach to education originated at a summer camp he founded in 2004 called the Tinkering School. There, children could experiment with saws and drills, tools other adults might want to keep out of their hands, to construct anything they wanted out of available materials. The summer camp was such a success that it gave Tulley and his co-founder Bryan Welch the confidence to form Brightworks. Since its founding, the school has become a place that challenges both traditional education and modern views of childhood. As if to drive its mission home, even the schools location is unconventional. It’s housed in what used to be an old mayonnaise factory, where light floods the room from giant windows and skylights overhead. The floor is made of soft cork, which is conducive to the often-bare feet of students. And the building offers an arts area, electronics lab, wood workshop, and a kitchen (currently a test-kitchen for an ongoing project to develop the perfect Brightworks potato chip). The school also has a place called “Kid City” – a two-story plywood fort full of nooks and crannies. “Kid City was designed by the children, built by the children to be their permanent sort of home within the school – their permanent home away from home,” Tulley explains. “They use it as a place for refuge when they’re mentally exhausted by some project.” The students helped build just about everything in the school, from the partition walls to pieces of furniture. 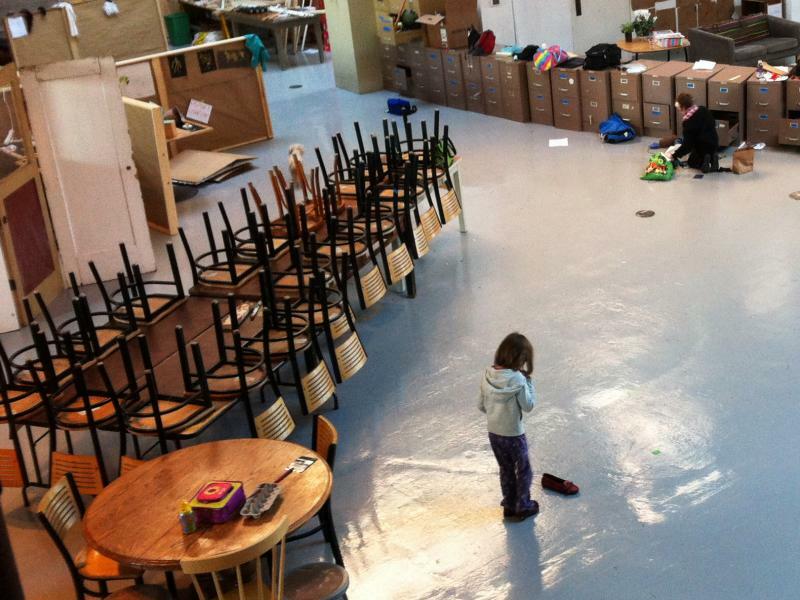 With all of its learning space in one wide-open warehouse, Brightworks is like a one-room schoolhouse. But instead of hearkening back to days on the prairie, the openness reflects Tulley’s 21st-century vision. “It’s to honor the creative impulses of the children, create an environment that provokes and engages the children in activities that they might otherwise not engage in,” says Tulley. Ten-year-old Elizabeth Zada Hathaway is one such student. She appreciates the freedom at her new school. “At my old school you kind of had to do what the teacher told you to do and here you can kind of opt out sometimes,” Zada says. Zada has attended several schools, but she says Brightworks is her favorite so far. “We don’t have to do a lot of sitting down and listening to people because that can be kind of boring and annoying,” she confesses. The Brightworks students aren’t the only ones who are fans of the school’s philosophy. Collaborator Rose-Price wants to create an educational atmosphere that's “ a place where learning actually [is] fun and almost invisible.” She’s young and energetic – and it shows in her teaching style. She’s like an older, wiser friend to her students. “It’s what my mom always dreamed of for me and what I’ve always wanted for myself,” she confides. Because Brightworks is a nonprofit, private school, it functions outside the jurisdiction of the California Department of Education. Teaching credentials are not required for Brightworks’ teachers, and students are not required to take standardized tests mandated at public schools. Without these test scores, Brightworks students could face obstacles if they attempt to transfer back into the public school system. Tulley previously worked at the digital media company Adobe Systems, headquartered in San Jose. Technology is at the core of learning at Brightworks so long as it’s used as tool. When one of the students asked to bring a video game to school, Tulley’s answer was no – but it wasn’t a rejection of video games altogether. “I said, ‘Yeah, if you write a video game, you can play it,” and so that process is unfolding,” Tulley explains. Brightworks is in its stage of infancy and what’s next for these children after they graduate seems uncertain. But Tulley sees the lack of complete structure more of an opportunity, rather than a challenge. Students will graduate with a multimedia portfolio-based diploma. Whether or not traditional high schools will see the years of work inside these portfolios as on par to other primary schools is not exactly clear. But if Brightworks leaves you wishing you could go back to primary school well, maybe you can. In the near future they plan to offer night classes for children – and adults – in the Mission District.